Lorraine Hems, a Rochester native, has been associated with the Finger Lakes International Wine Competition since the competition began 18 years ago. She's a lecturer at the Rochester Institute of Technology's Department of Hospitality and Tourism Management. She's also an instructor at the New York Wine & Culinary Center in Canandaigua, NY. Lorraine is a Certified Sommelier with The Court of Master Sommeliers, Certified Specialist of Spirits and Certified Wine Educator with the Society of Wine Educators, Certified Bordeaux Educator with Lecole du Vin de Bordeaux/SOPEXA and a Certified Wine Judge through American Wine Society. She's currently completing her Diploma with the Wine & Spirits Education Trust. 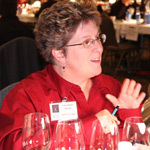 Ms. Hems is an instructor of WSET courses as well. Lorraine's an active wine judge domestically and internationally including the New York Wine & Food Classic, US, International Eastern Wine Competition, US, CatadaOr W, Chile and La Mujer Elige, Argentina. Lorraine enjoys various roles with Women for WineSense, AWS and SWE that have included volunteering behind the scenes, presenting and teaching at national conferences. In 2012, she received the Lifetime Achievement award from the WWS.